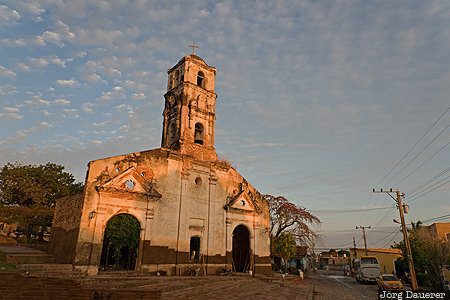 The ruin of the church Iglesia de Santa Ana in Trinidad below a cloudy sky illuminated by warm evening light. Trinidad is in the province Sancti Spíritus in the south of Cuba. This photo was taken in the evening of a sunny day in March of 2016. This photo is part of the exhibition Rust, Wrecks and Ruins (February 2014). This photo was taken with a digital camera.